Dear Isaac Newton - Up For a Tug of War? A science teacher walks in with a rope, a skateboard, bocce balls, and balloons. Sounds like the beginning of an interesting joke, right? Nah. It's just your average day in the Middle School science room. Students in Josh Garrison’s Form 2 science class had a chance to explore physics in a variety of interesting ways. 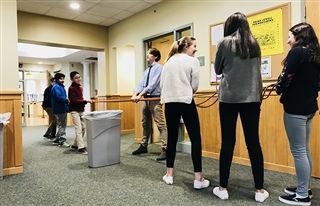 The class started with a friendly competitive tug of war in the hallway. All things even, the girls won handily the first round. Then, things got interesting as Garrison added a variety of factors. Curveball #1: the girls’ side had to try it sans shoes (boys won). Curveball #2: both sides had to compete with plastic bags on their feet (tight match to say the least). The takeaway? The more you push into the ground, the more the ground pushes back. Which explains…..you guessed it. Newton’s Third Law: For every action, there is an equal and opposite reaction. No matter how hard teams are pulling, there are other factors at play that superseded the force that they were imposing on the pulling of the rope. Back in the classroom, Garrison positioned the lesson with a different perspective and had a student stand on a skateboard. He handed her a bocce ball, asked her to throw it and asked the class if they thought she will move when she threw it. She did...a little. Next, Garrison hopped on the board, only this time with a full bag of bocce balls. He collected guesses as to what would happen, then, throwing the bag, he had another student catch it. The result matched most all of the guesses. He moved a lot more on the skateboard than the student who threw the first one. More mass = more movement. Next, the class populated Newton’s equation with elements of the experiment. For every action (the throwing) there is an equal and opposite reaction (which is….?). After some deliberation, the concept of inertia was brought into the discussion. Inertia is the reaction - the inertia of the balls. The greater the inertia of the object, the more you move back. Garrison took the lesson one step further - a big step actually - that's out of the universe. 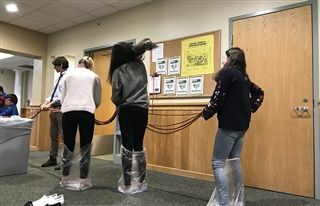 The students applied the concept of a rocket launch to that of a balloon. Rockets use thrust, the pushing force created by energy. Much like a balloon whose force is contained in the small opening, a rocket relies on that thrust to propel itself into the atmosphere. Thrust is created by the force of burning fuel as it comes out of the engine. As the engine pushes down, the rocket takes off. The class finished the class with a competition that embodied this concept - as they cleverly called it - the “space race”. Again, they broke into two groups and each side received a balloon, a string, and tape. The challenge was to build a system with only these three materials while incorporating Newton's Third Law to get the balloon to the other side of the classroom. Through a series of experiments and tweaks to the process, students discovered different sizes and shapes of balloons will create more or less thrust to eventually enable it to reach its destination. One thing was for sure. Newton himself would have enjoyed seeing the collaboration, thoughtfulness, and having physics brought to life in these inventive and fun ways.